Along a maritime journey of more than 150 years, Hong Kong’s maritime and port industry has been going from strength to strength, and has made significant contributions to our social and economic development. 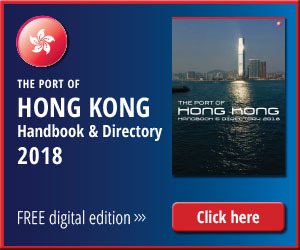 Today, Hong Kong has established itself as a premier international maritime centre that is home to one of the world’s largest shipping communities, with roughly one tenth of the world’s merchant fleet, and a vibrant maritime cluster providing a complete range of high quality maritime services, from ship management, ship finance, maritime legal and arbitration services, to marine insurance, ship agency, and many others. For the sustainable development of the industry, it is important for the government and the industry to work hand in hand. To this end, we established the Hong Kong Maritime and Port Board in 2016. The Board aims to foster seamless partnership with the industry and stimulate insightful exchanges and directions for policy formulation. Noticeable progress has been made, most visibly from the Chief Executive’s Policy Address in October of a broad range of policy initiatives that will collectively take Hong Kong’s maritime offering to new heights. They include tax concessions for ship leasing and maritime insurance, favourable support measures for the arbitration and maritime training sectors, as well as continued efforts to step up promotion of the industry. Promotion is most effectively conducted in partnership with the trade. Hence the Annual Hong Kong Maritime Week was inaugurated in 2016. Hong Kong Maritime Week is now a signature annual event in the shipping calendar. Based on our experience and knowledge gained through the previous editions, Hong Kong Maritime Week 2018, with an even greater diversity of presentations, promises to be the best ever. Some 60 organisers from home and abroad have geared up to stage well over 50 activities this year. The wide variety of activities span across eight themes, from shipping and maritime, ship finance, marine insurance, maritime law and arbitration, ship management, port and logistics to maritime technology, and education and career, offering an extraordinary range of seminars, conferences, forums and networking platforms that will both inform and entertain. The Hong Kong Maritime Week is meant for the community, as well as the industry. This year, we have activities hosted by globally renowned institutions like the Lloyd’s List, BIMCO, Mare Forum and Marine Money, providing platforms for professional exchanges on latest issues of common concerns. We also have other fun-filled programmes targeting particularly the youth and the general public; for example, HKMW Orienteering Race, Pi’s Adventure in Victoria Harbour and Family Fun Day. I can assure you that there will be something for everyone. My heartfelt appreciation goes to all organisers for their contributions in making the Hong Kong Maritime Week 2018 a great success and help in reinforcing Hong Kong’s role as a leading international maritime centre. At the Hong Kong Maritime and Port Board, I myself and every Board member have been working tirelessly in strengthening Hong Kong as the region’s premier maritime hub. To help you appreciate more about the latest undertakings of the Board, the chairmen of our three committees – Maritime and Port Development, Manpower Development, and Promotion and External Relations – will explain in details the achievements made to date. This is just a prologue of the upcoming Hong Kong Maritime Week 2018. A fabulous line-up of diverse activities will soon be unfolding. Do mark your diary for this eventful week, and I hope that all of you will benefit and enjoy from participating in the Hong Kong Maritime Week 2018.